Jason Brous is a custom knifemaker whose work is the melding of his experience in CNC machining and his love of Biomechanical art. Biomechanical art is a synthesis of machine and organic forms. It was popularized by the renderings of artist H.R. Geiger, whose eerie designs are seen in the Alien series of movies (think of the curvy exoskeleton of the Alien). Brous Blades have their own synthesis of curves and lines that make them visually attractive and strong. I saw one of Brous’ knives on a co-worker’s desk and I think I asked to examine it after I already had the knife in my hands. 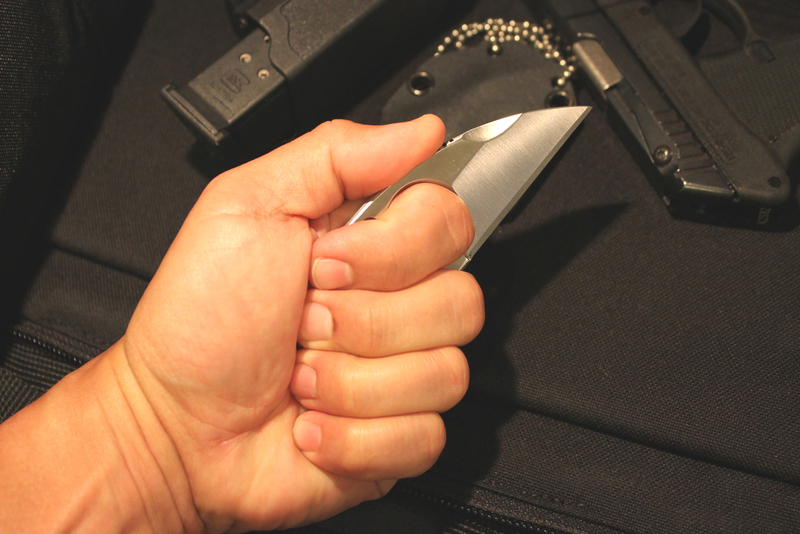 The wharncliffe blade profile has a 2” cutting edge. Overall, the knife is 4 ¼” in length. Brous’ knife has a flat double grind. The flat grind on the short blade leaves lots of steel behind and results in a rather beefy point. The point is sometimes a delicate area on lesser wharncliffe knives. I was intrigued by the two chamfered 7/8” holes in the stubby handle. Placing my index finger in the forward hole gave me that “ah-ha moment” when the Silent Soldier locked into my palm. Very secure. Flipping the Silent Soldier around, I found it worked in the reverse grip edge out hold as well, with my pinkie riding in the forward hole. A short section of jimping adorns the spine of the blade. Two swedges are cut into the top of the blade to thin it for penetration. A scallop on the lower part of the handle and three decorative holes round out the knife. The Silent Soldier is issued a solid Kydex uniform to wear. 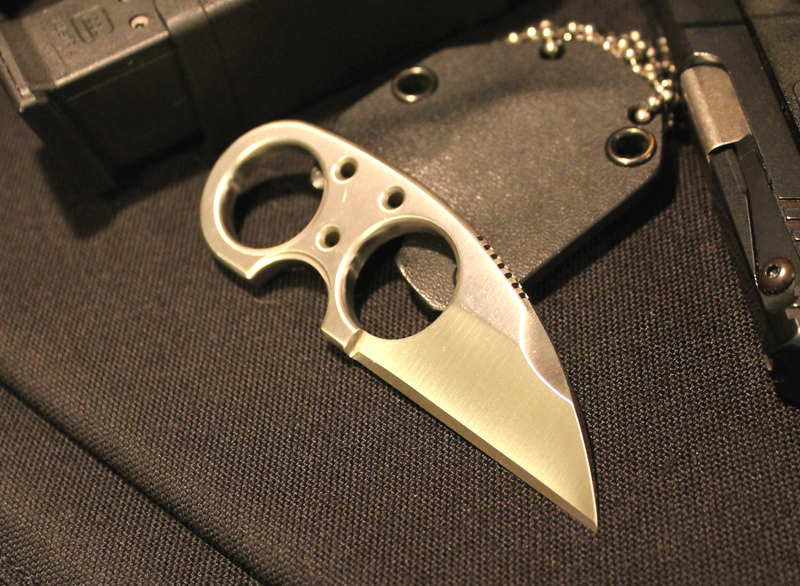 The riveted sheath allows you to insert your index finger and push with the thumb to pop the knife out. 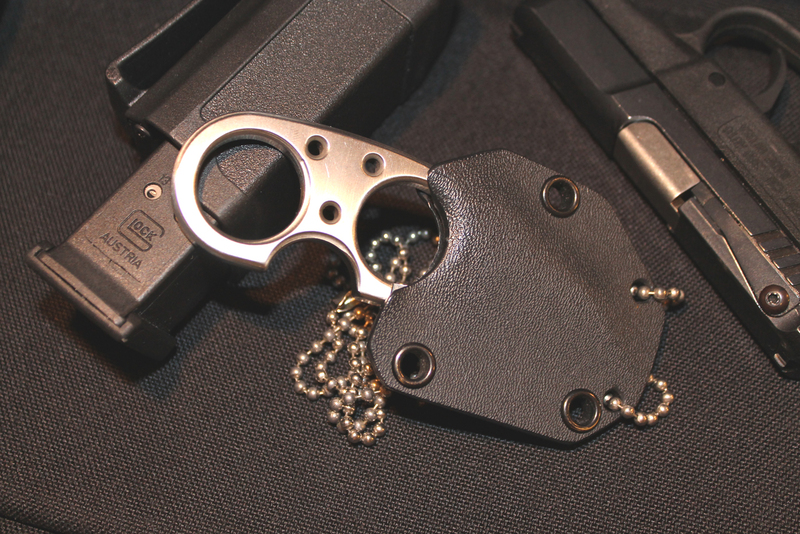 It can be worn either with the provided 30” ball-chain or a pocket clip. I absolutely love the bulletproof feel of this knife. Despite this knife’s unapologetic heft, it burdens the scale to only 2.4 ounces or a total of 3.2 ounces in the sheath. The Soldier handles fast in the hand and is extremely difficult to disarm. A little knowledge of human anatomy can make its 2” blade deadly. 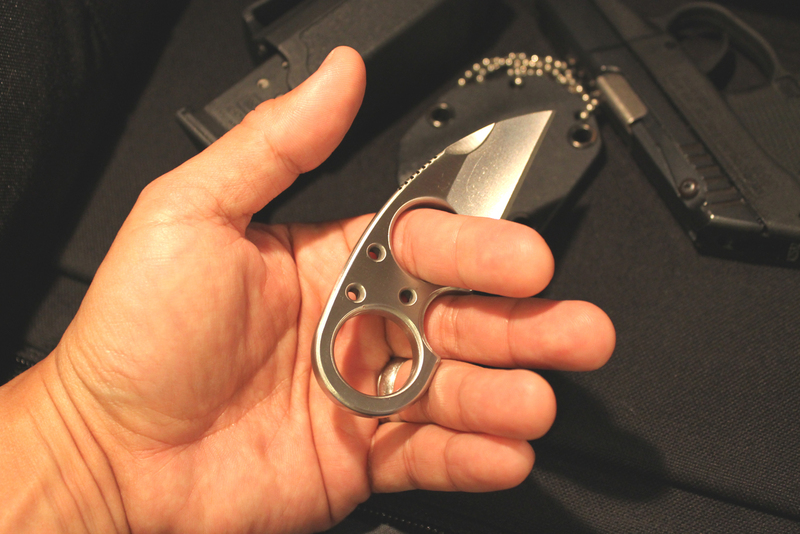 Silent Soldiers are available in wharncliffe, tanto, and drop point styles. They are nicely finished in either satin steel or black Cerakote. The Silent Soldier is as tough as a Starship Trooper (from Heinlein’s novel, not the dismal movie). For a handmade knife of this high quality, an MSRP of $99.00 seems like a typo. And I just on-line ordered one for twenty bucks less than that! 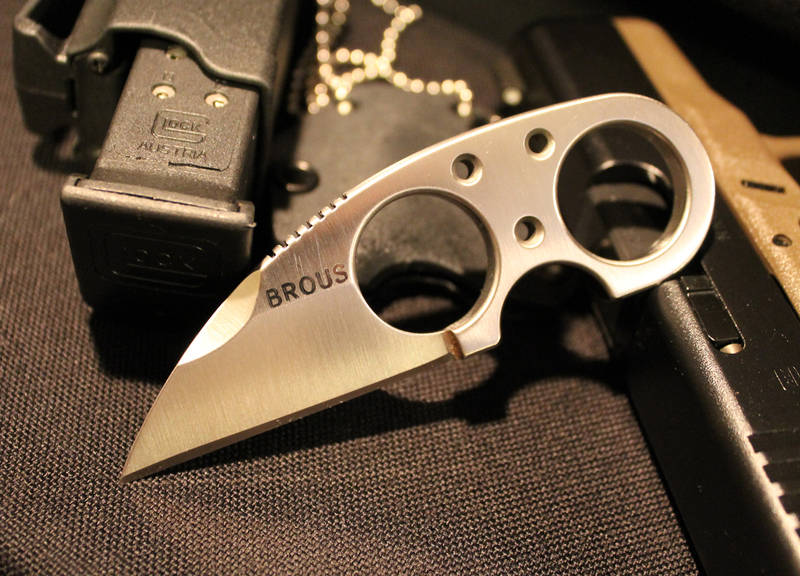 As either a defensive weapon or utility knife, the Brous Blades Silent Soldier is prepared to serve. 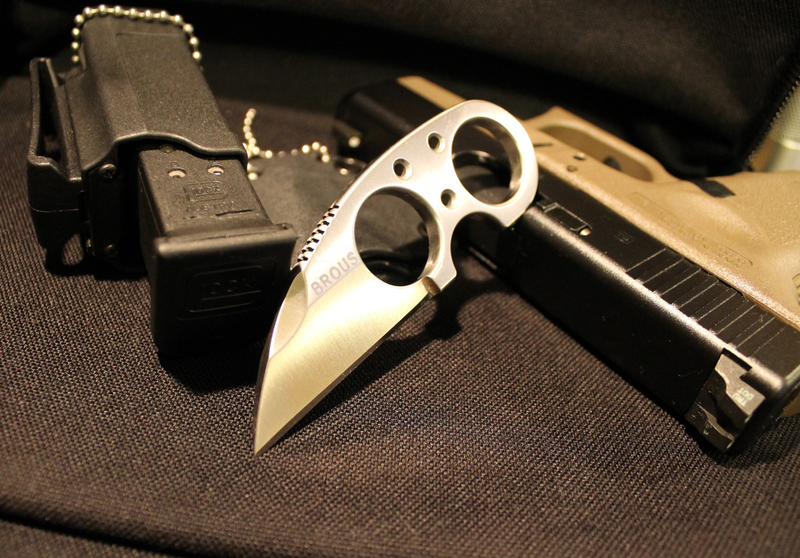 This entry was posted in Concealed Carry, Knives and tagged Brous Blades, Brous Silent Soldier, neck knife, police neck knife. Bookmark the permalink.